Centaur is without a doubt the safest fence you can get for your livestock. It doesn’t snap together like other plastic fences(and therefore it doesn’t snap apart either). If the care and safety of your animals, whether they are multi-million dollar stallions or the families’ pet llama there is no better fence to be found. Centaur fence is manufactured so there is no cutting of old growth forests, just how many 16 foot long white oak trees are left for cutting, if you can even get oak boards its even harder to get good oak boards. Its bad when you can look back at fence you have just built and you can see the boards warping and splitting just a few months later. 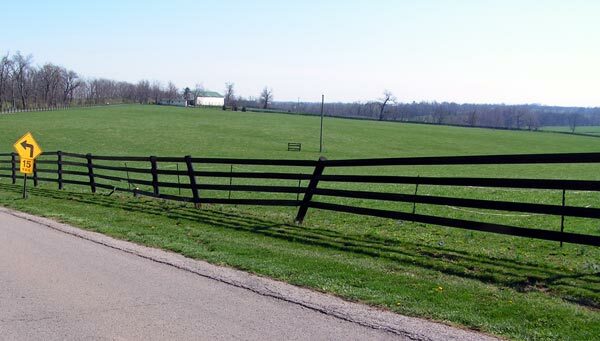 It takes 23,760 board foot and 660 posts to build just one mile of board fence. 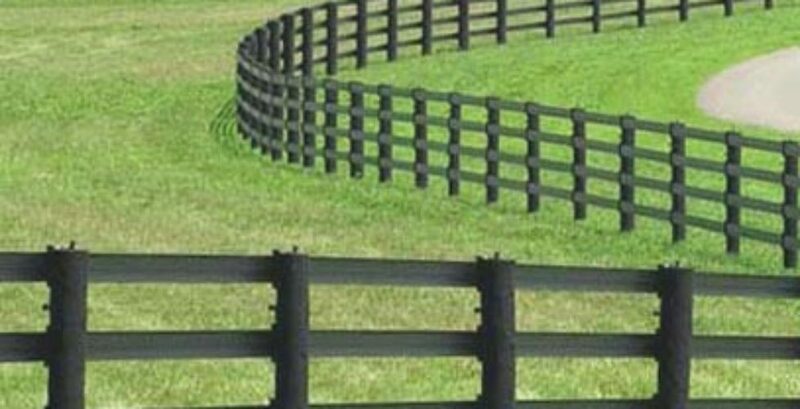 When it comes to installing Centaur or really any vinyl fence you really have to have the installation done correctly. We here at Dennis Fence have installed more miles than any other dealer installer in the country. Most other installers talk about footage of fence they install, we on the other hand talk about the miles we have put up. Me and my father Russell Dennis have been consulted by Ed Robbins, the owner of Centaur, because of our dedication to installing it correctly. Because of our experience in the building of Centaur products you can rest assured that when we build this fence for you it will be done correctly. 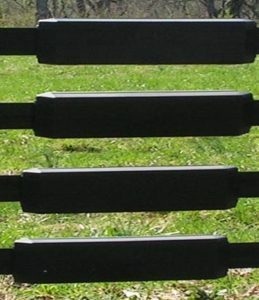 Dennis Fence is the only company that uses the patented polymer tension system. One of the best things about this tensioner is that it is not an eyesore like the old box system is. 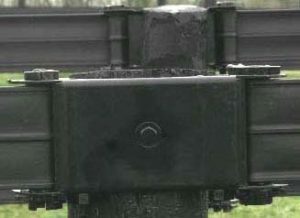 The tensioner is zinc coated and then powder coated to the color of the fence. There are other tensoners that are based on this idea but they are not nearly as strong or easy to use. Up until about 6 years ago the only way to put tension on Centaur was these ugly old boxes that would have to hang out in the middle of 2 posts. They were ,and still are a eyesore, so we went about trying to improve the system. One day when my father (Russell Dennis) was strapping down some posts with a regular old ratchet strap he thought about turning them on their side and rolling the polymer up in them. That was how the whole idea started. The first prototypes were installed at Pretty Run farm in Clark county 6 years ago and are still working perfectly til this day. How tough is the fence? 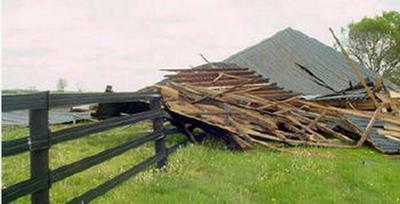 Well this is from a tornado about 8 years ago, as you can see it took the entire barn picked it up and laid it – none too gently – down on the fence. Obviously there was some repair to be done, broken posts and some ripped rails, but the integrity of the field was not harmed and the horses did not escape. In the picture below you can see what happens when a car tries to make a shortcut through a field fenced with Centaur. Notice how the Centaur holds up the broken post.